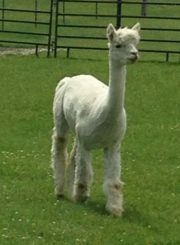 Tiddly is a white female our of Likarose who has a grey background, and Archangel’s Malachi, with Legacy genetics. She has proven to be a good producer and great mom, giving us her 3rd female cria in 2018. She was left open this year, but could be re-bred for a new owner.